There are many things being said about Steve Jobs as a person, some good things and some less good. Regardless of how he was perceived as an individual however, I believe everyone can agree that Steve Jobs was a game changer, who revolutionized the world of business. His story is inspirational, and if you are interested in learning more about him there are a Steve Jobs movie and a Steve Jobs book which you can look up. In preparing to become a successful business leader one of the most important things is to learn how to become an inspiration to others. There is a fine line between good and great leaders, yet not many of us manage to cross it. For this article we’ve put together 21 famous leadership quotes which will change the way you see leadership. We hope that these short inspirational quotes will help you become a better leader, a better person, and a better entrepreneur. 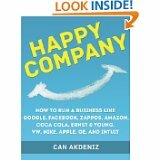 Happy Company shares 14 simple concepts that will help you create a successful business. Many companies – including Google, Facebook, Amazon, and Apple – have achieved their current levels of success by understanding the importance of setting happiness as a major business goal. Happy Company will help you learn how to use creative compensation strategies, realistic approaches to building company happiness, and visionary leadership to achieve the happy and healthy company that you want. Although profits do not always lead to happiness, happiness does lead to profits and success and Happy Company will help you learn how to achieve the right kind of happiness to ensure the business success that you desire. Happiness doesn’t just affect company employees, though; Happy Company also deals with developing customer loyalty, standing out from the competition, and maximizing stakeholder trust and support. In the long run, conflict is inevitable in any situation which involves more than one person. This, of course, includes the workplace. Conflict can arise for a multitude of causes, from differences of opinion to interfering goals. When we get involved in a conflict, we need to understand the importance of managing it properly. Doing otherwise can lead to permanently damaging our relationship with the other party, lower productivity, or a tensioned environment. For businesses this means a serious blow, as a seemingly unimportant conflict can seriously hinder their activities. This is why understanding the basic five conflict management strategies is very important for both regular employees and business owners, who can help mediate a conflict they are not directly involved in. This is one of the most dangerous conflict management strategies, because one or both of the two parties avoid discussing the conflict. Ignoring the conflict doesn’t resolve it as hoped, however. Confrontation is necessary. This strategy is only useful when implementing a temporarily unpopular measure by the leadership, when the problem will go away by itself after a while. This strategy involves making the concessions the other party wants. It can be useful when the issues are unimportant, but used long-term the conceding side will become frustrated with the situation and resentful. This strategy focuses on finding a solution both parties are happy with. It’s a win-win situation, but because of the time investment it requires, it is not suited for a number of situations, including those in which fast action is paramount. This strategy leads to both side giving up some of the things they asked for in order to reach a solution. It’s a strategy best use when both parties hold similar levels of power, and when both parties have something to lose – during a negotiation, for instance. Treating the conflict like a competition means assertively trying to get your demands met with no consideration for the other party’s expectations. It’s not a strategy that should be used very often, as it can lead to resentment. It’s generally suited for crisis situations, or adopting unpopular measures. Finding it hard to get your team working well together? Here is my top 10 tips to improve your team performance! Make it clear to the whole team that the workplace needs to be treated with dignity and respect. Observe how each of the members communicates with each other; their tone of voice, language, body language etc. Talk to your team and find out what makes them inspired. It’s often not about the money — see this McKinsey Quarterly piece on Motivating people: Getting beyond money. Set goals for the team. This is a way for you to lead them but also something for the team to strive for. When setting goals, make them attainable. If you have one big objective, break it down and set goals that can be attained in a shorter period of time rather than months from now. Achieving the smaller goals makes it easier for the team and gets them motivated to continue towards the overall goal. Employees like to know what they’re doing is right. Show them that you appreciate their work. Give kudos to show your acknowledge their hard work. Try Rypple, for easy public recognition. Employees always want to know how they’re doing. Constantly provide continuous feedback to your team. If you want your team to improve their performance, then improve yours! Be an example of what you want your team to look like. Have a continuous flow of communication throughout the team. Make sure you are involved too. Open communication is important for a team to work well together. Make it easy and comfortable for employees to approach you. If a team member can’t approach you, it creates a tense environment. If you delegate effectively to team members, it frees up some more time for you and you can manage the team better. Make sure you delegate the responsibilities to the right people – it will keep them learning. This is a hard part of the job, but very necessary! Stay on top of individual performances, if one person is lacking, the whole team will too. You want people to enjoy their work, if they don’t, they won’t want to do their work. Try scheduling something once a month to have fun with the group and interact outside of work. As a manager you need to be a supporter of that fun! The way a team can work together denotes how successful the company is or will be.